It is possible to be competitive in yoga, although not helpful: competitive with others and with yourself. Ultimately yoga is bring in the moment, accepting who you and celebrating life. Here is some brilliant inspiration. 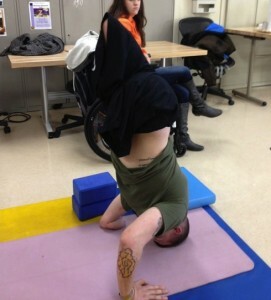 Hickman who’s been teaching yoga classes at Walter Reed for the past 6 years knows modifying and checking in with the students every day to see how they’re doing is important, as well as keeping the yoga open and social. Here is a true example of strength and courageous, of going beyond expectations and making your own reality. When you do yoga let this serve to inspire you that everything is possible if you have te courage to explore. Courage to explore and KINDNESS! Read back over this article – if in doubt… These vetrans are not pushing and shoving and striving to go beyond. They are practicing a true yoga of self kindess. They are going their own rate and feeling every moment. This allows them to practice safely, be in the moment, deepen their practice and expand beyond their expectations. Through this perceptions change, pain changes and barriers change. Not because they are forced to, but through self kindness they dissolve. This is true yoga.